oxygen carrying capacity increases due to the creation of extra red blood cells. What on Earth is a superbug? Imagine having an incurable bacterial infection that doctors can’t stop from spreading. How long have you got to live? You are asking yourself, how this can be possible in the 21st century. The era of the superbug has dawned upon us. According to the Centers for Disease Control and Prevention (CDC), about 2 million people get sick from a superbug every year, out of which 23,000 die. How super is a superbug? Doctors often use phrases like “multidrug-resistant bacteria.” That’s because a superbug isn’t necessarily resistant to all antibiotics. It refers to bacteria that can’t be treated using two or more. So no big deal right? Cancer chemotherapy, organ transplants, surgeries, and childbirth all rely on antibiotics to prevent infections. If you can’t treat those, then we lose the medical advances we have made in the last 50 years. How do I protect myself from a superbug? Do not misuse antibiotics by taking them when you don’t need them or by not finishing all of your medicine. According to the CDC, this is the “single leading factor” contributing to this problem. Also know that the more antibiotics you’ve taken, the higher your risk of catching a superbug. The hospital is also a high-risk place to be. The more visits you to the hospital setting, the more you risk catching a superbug. In the hospital environment, you may catch a superbug through what experts call ‘healthcare-associated infections’ (HAIs). According to the CDC,” Many of the most urgent and serious antibiotic-resistant bacteria threaten patients while they are being treated in healthcare facilities for other conditions, and may lead to sepsis or death.” So make sure the doctors and nurses are following the right protocol to avoid infections. The use of antibiotics in farm animals leads to an increased risk of antibiotic resistant infections in humans. Get your meat from your local farmers, it may be more expensive but it tastes better and is much safer. 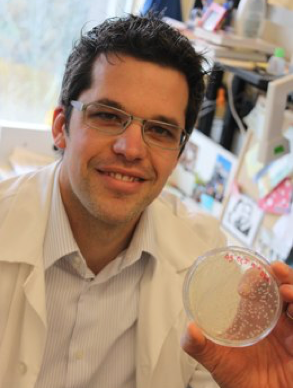 What can science do to fight antibiotic resistance? 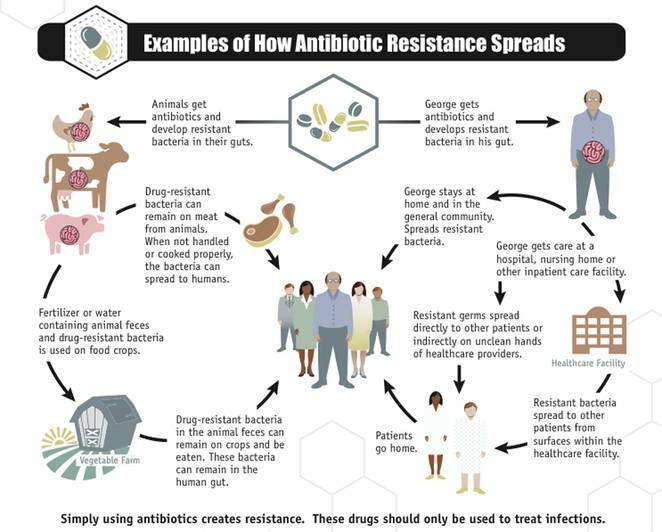 There are multiple ways we can manage antibiotic resistance. The following is a mix of current, well-accepted methods, as well as some ideas that are still being explored/tested. (a) Limit use of antibiotics (agricultural use and inappropriate prescribing, as well as over-the-counter availability in many countries) and encourage correct use (finishing the course of treatment). 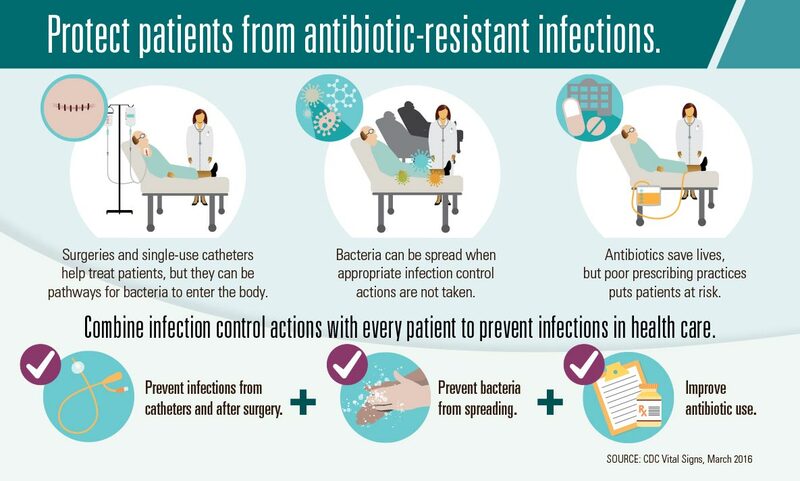 (b) Prevent resistant bugs from infecting others (infection control in clinical settings, plus regular public health interventions to reduce transmission). (c) Combination therapy – treating with multiple drugs simultaneously. Using two or more drugs makes it harder for resistance to emerge, since the bug would have to develop resistance to both drugs. (d) Vary the selection pressure. The more consistently a drug is used, the more advantage there is in being resistant. Using a variety of drugs (by giving different drugs to different people or switching the “drug of choice” every few years) may help prevent or reduce resistance. (a) Find drugs with mechanisms of action (ways of killing) that don’t overlap with current drugs. When drugs share a mechanism, resistance to one will often mean resistance to the other. Finding drugs that work in different ways helps avoid this, and also works better for combination therapy. (b) Search for drugs that are hard to develop resistance to. As we learn more about how different drugs kill, and how resistance works, drug development can be smarter and more targeted (as opposed to random screening of thousands of compounds for antibiotic activity). (c) Unfortunately, developing new drugs is expensive, and pharmaceutical companies weigh the cost of development against a new drug’s money-making potential. We badly need new drugs for malaria and tuberculosis, but since these are mainly diseases of “poor people” who can’t afford expensive new drugs, pharm companies consider it a bad investment. (a) In some cases, when a drug stops being used because of resistance, the resistance will actually start to go back down. This is because of a “cost” of resistance, meaning when the drug is not there, the resistant types don’t do very well. An example is that chloroquine-resistant malaria is present in many places, but in a number of places where chloroquine is no longer used, the resistance has decreased. If we can control drug use enough to make this happen, we may be able to “save” some drugs that are losing their effectiveness. (b) In some cases, there can be a “trade-off” with resistance to different drugs. You can be resistant to drug A, or to drug B, but not both. If resistance to drug A is very common, and you start treating everyone with drug B, the bug might evolve resistance to B, but would have to lose the resistance to A. So, you might be able to start using A again in the future. This won’t happen in every case, or even very often, but when it does happen it can be a neat solution. So we can conclude that antibiotic resistance is not the end of antibiotics. The superbug that just came to the U.S. is still treatable as I explained. We have been creating more and more resistant strains by misusing antibiotics, be it through direct consumption or through farm animals. Perhaps someday all bacteria will be resistant to all types of current antibiotics, but that just means we will have to discover a new type of cure. Blink Health created an infographic that describes the differences between generic and brand name drugs and we feel it is important we share this with you. This, given the number of people who are overpaying for prescription drugs. 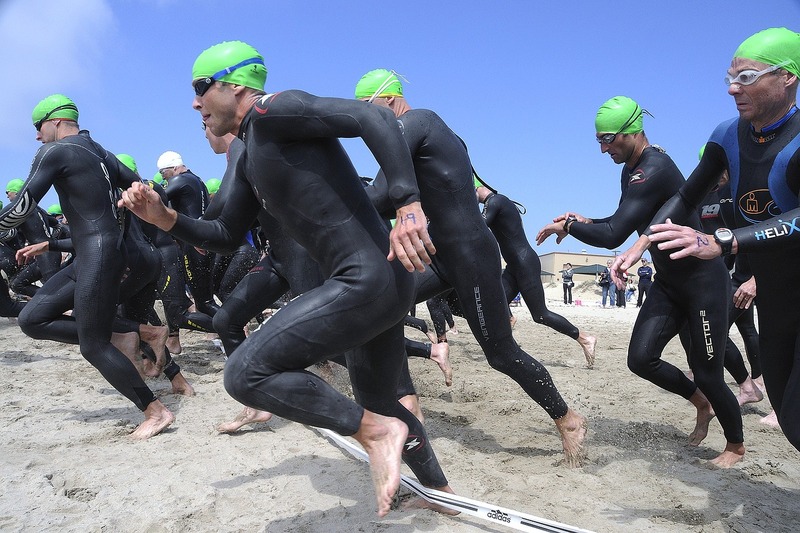 Here at The Zeit, we have talked about how the Fitness & Health industry is making millions by taking advantage of desperate people trying to lose weight or look a certain way. We have also featured blog posts about the likes of FDA possibly suppressing a possible AIDS cure and how most supplements are a waste of your hard-earned money. We hope our readers benefit from our latest look into the vague world of the health industry. Blink Health‘s mission is to make prescription medications available at lower prices to millions of people across America. They are the first company to develop a proprietary technology to group millions of patients together, creating the strength to negotiate the lowest drug prices possible. They are also the first company to allow patients to purchase their medications online and pick them up at their local pharmacy. Let’s face it: We all need an energy boost now and then. If you don’t have time to get to the gym (exercise is a natural energy booster) or to take a snooze, you might reach for an energy drink instead. The only problem is that manufactured energy drinks have a slew of side effects, including chest pain, heart palpitations, and seizures. That’s because they often contain excess sugar and caffeine, which has adverse effects on how your body functions. This is highlighted in the article ‘Energy Drinks vs Anti-Energy Drinks‘ by 12 Keys Rehab Center. For these reasons and more, it’s important for energy-seekers to expand their horizons and start testing natural alternatives instead. 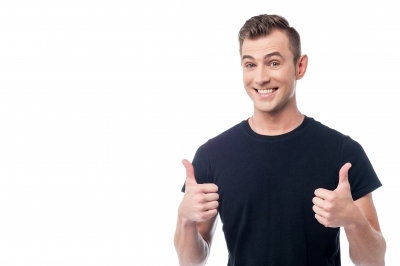 We’ve gathered five options for easy and natural alternatives that’ll give you a buzz without the bite. Bottoms up! Hailing from South America, Yerba Mate has been said to have it all: the energy boost of caffeine, the health-improving effects of tea, and the feel-good vibes of chocolate. In fact, the mate leaves used to make this beverage contain 24 vitamins and minerals, 15 amino acids, and antioxidants galore. In other words, drinking it will boost your energy and improve your overall health, which is more than most manufactured energy drinks can say. 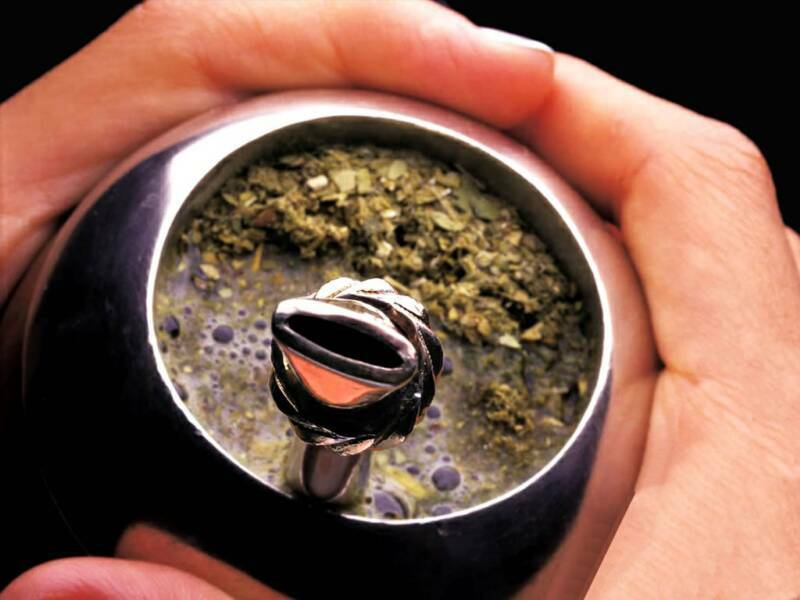 To prepare Yerba Mate, you need a special mate cup designed to make preparation easy. Other than that, it’s made much like regular tea: After adding the leaves to the bottom of your cup, add hot water and let it sit for about 30 seconds. Then, put the mate straw into the leaves-and-water combo before adding enough hot water to make a full glass. Love for green smoothies has been widespread for some time now, and for good reason: The inclusion of so many fresh veggies delivers a wealth of vitamins and minerals that you might not otherwise get in your diet. Recipes for green smoothies are all over the Internet, too, so you should have no trouble finding one that gives you the power you need to push through a long morning or afternoon slump. As you get used to whipping up your own smoothies, you’ll probably start experimenting to find a personal, perfect iteration. 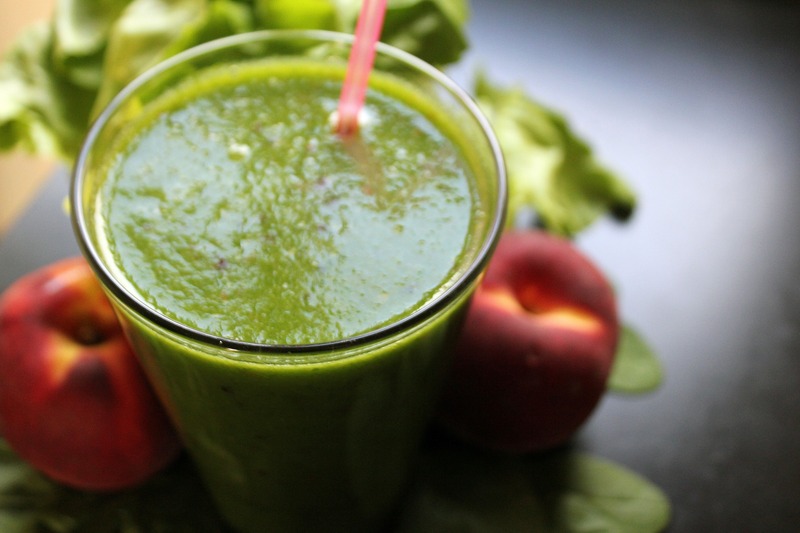 As a starting-off point, here’s a recipe for an energizing green smoothie. All you need to do is blend 1 cup of baby kale or spinach with 2 cups of pineapple. Once that’s done, add 1 cup of ice and up to 2 tablespoons of chia seeds to complete your cool treat. The green trend continues with green tea, a widely revered beverage in the world of health and fitness. Most teas can provide us with an energy boost, but green tea has an added bonus: It also contains theobromine, which enhances your circulation to energize you both physically and mentally without overdoing it. It’s easy to prep, too, and can be done in just about any office that has a hot-water tap or microwave. Steep your tea bag, sip and feel better without any jitters. One common source of fatigue is dehydration – if you’re thirsty, that means you’re already dehydrated. 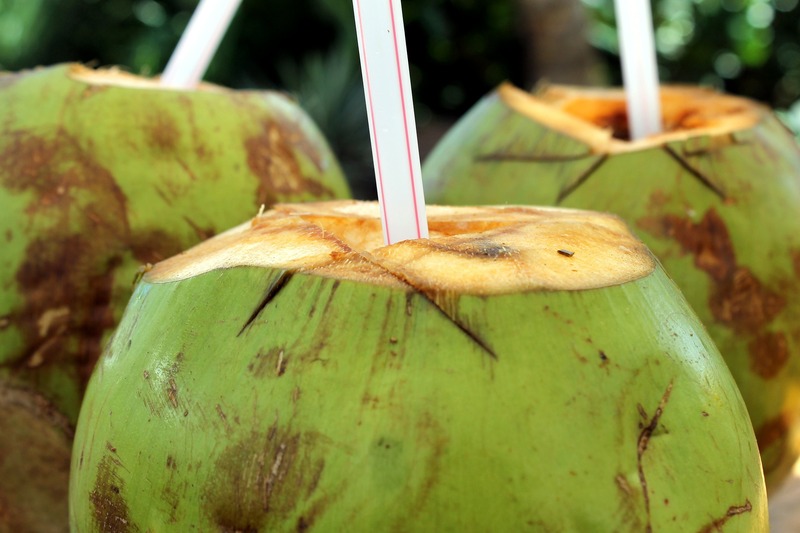 While any one of these beverages will help you fight dehydration and, therefore, boost energy, coconut water is known for its dehydration-fighting abilities. That’s because it also contains carbohydrates, electrolytes, potassium and minerals to get your body hydrated and energized faster than plain old water. Honestly, though, we can’t knock that as a remedy for low energy, either. Make your way through a large glass and reap the mood-boosting effects. See? You don’t need to reach for that energy drink next time you’re feeling less-than-stellar. Instead, whip up or pick up a natural alternative that’s just as effective at fueling you through the day. Cheers to your health! What’s your tip for picking yourself up when you are feeling less energized? Leave me a comment below. There are over 54,000 dietary supplements in the U.S. alone claiming to help you gain muscle mass, lose weight or boost your immune system. Have you been wasting money on supplements that in reality do absolutely nothing for you? If you are currently using supplements or are planning to do so in the future then I suggest you continue reading. Anything that is properly regulated must be safe right? Wrong! We all know that medicine has very strict regulations and yet sometimes these same medicines cause harm to the person using them. Take thalidomide for instance which was used as a cure for morning sickness. It actually caused about 20,000 birth defects. Would You Take Potentially Risky Drugs That Improve Cognitive Function? Taking cognition improvement drugs isn’t worth the risk. Will You Get a Passing Grade for Self-Care? Take the Test!